Bharti Singh Chauhan is the founder of the Praveen Lata Sansthan, an initiative that works for the betterment of women and children. I was born in a middle class family in Jaipur. Initially, my family was very well-to-do. But, one incident changed everything. My brother met with an accident and was handicapped for life, and as a result, we suffered a great financial loss. Soon, it became clear that there was no money for my education. My father told me that he couldn't afford to pay my school fees when I was in class nine, owing to the major responsibilities at home. But, I wanted to study and did not lose hope. I began to stitch the falls for sarees for women to be able to pay for my education in Class 10. By this time, my responsibilities had risen, as my father had had an accident and suffered a vision issue, which resulted in the loss of his job. Now, along with stitching falls for sarees, I had begun taking tuitions for children and held down a part time job in a lingerie store. My mother knew the importance of education as she was uneducated herself. This was why she wanted me to study and become independent. It wasn’t easy, but she motivated me. Between taking up jobs like stitching, putting mehndi for other women, selling lingerie and the like, I managed to deposit my fees and somehow completed my education. However, things were not smooth as my personal safety had begun taking a beating. Men who worked with me tried to abuse me. If not for that, I heard a lot of abusive comments and words from my relatives when I went out of home to work, and when I went to the lingerie shop to work. This spread negativity in my family, and they began to pressure me to get married. I had a clear vision of my future and was not willing to listen to any negativity. I continued my studies and eventually went to college. After graduation, I began to work in a small outsourced bank, and then went to a newsprint media house in Rajasthan, called Rajasthan Patrika, and later, Dainik Bhaskar. With time, my hard work began to pay off, and I found myself in a leading Telecom MNC. I had two ladies in my life who were my role models. One is my mother, because of whom I gained inspiration to continue my studies. Her positive vibes helped me fight all odds in society. I became a leader. The other lady was my mother in law, who was a victim of domestic violence. My father in law had illegal marriages and continued them till I got married to his son. My mother in law was highly educated and was the principal of a school. She never took the initiative to talk about it. She tolerated it, but whenever she talked to me, she motivated me to be a supporting hand to many. She told people like her wanted to take a step, but traditions, principles, and mindsets can only be changed when we have a supporting hand and that called for action. I lost both of them after my stint with the Vodafone Foundation working for Street life at Mumbai for Salaam Balaak Trust in 2012. In 2012, I lost my mother, Lata, and my mother-in-law, Praveen. In their memory, I decided to take my cause further. I set up the Praveen Lata Sansthan along with my Husband, Bhuvanendra Singh Chauhan, investing my savings so that I could offer more services to the needy. The Praveen Lata Sansthan is working for Holistic Development of Child Welfare, Women Empowerment and Rural Development across Rajasthan and Delhi. Although working on all the above parameters, one of our main focus goals remains Gender Equality, Education and Health. I see so many men and boys who will respect their mothers and sisters but will disrespect their wives and vice versa. Or, the boys might respect the women in their lives but will eye other women with lust, disgust or disrespect. So, we first need to change their mindset towards women as a community constructively We tell everyone not to discriminate, but the fact is that bias and discrimination start from your own home. And, it’s not just in the rural areas but in the urban sections of the society, too. It’s the mothers who discriminate between their son and daughter. They will teach their daughters everything, and would hand-feed her son and make him unworthy. We are a country of culture, and we imbibe values and morals from our elders. So, it is imperative that from the early age, we inculcate the right values. And, I believe, Education is the only tool that shall ensure girls to be independent which will help them realize their own importance. Back when I began working as a teen, and even as I began to grow economically and financially, I was fully aware of the fact that there were many children who suffered many difficulties like me. I made sure to work with these children, volunteering my time with NGOs as a teen. But in 2013, when I realized that I could make an impact on my own, I founded the Praveen Lata Sansthan. I invested all my savings and began to work at the grass root level. I worked with slums and communities for the holistic development and welfare of children and the empowerment of women. 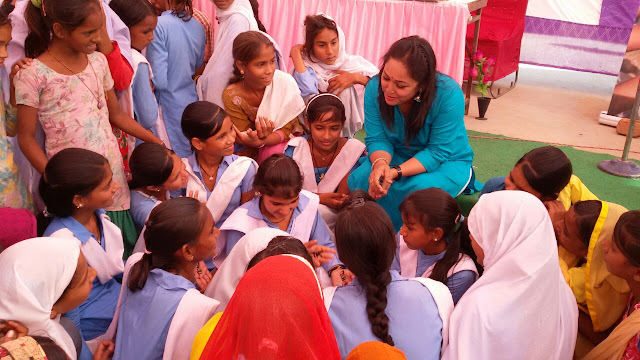 I have been able to educate over 17,000 girls on personal safety through workshops, over 1,55,000 people at community level on the importance of saving and educating girls. I work on stopping child marriage through road shows and street theatre, with the help of volunteers. Right now, I’m working on supporting over 150 children with their education, grooming and development, across various slums. I have been given the distinguished opportunity of being recognized for my work. I was the winner of the World of Difference Program by Vodafone Foundation in 2012 for working for Street Kids at Mumbai and is known as Ambassador for Vodafone Foundation. I am also an Ambassador for the International Girl Rising Campaign, which was launched by First Lady Michelle Obama, and is promoting the education of girls in Rajasthan. I was recently recognized by Honourable President of India, Shri Pranab Mukherjee and Smt. 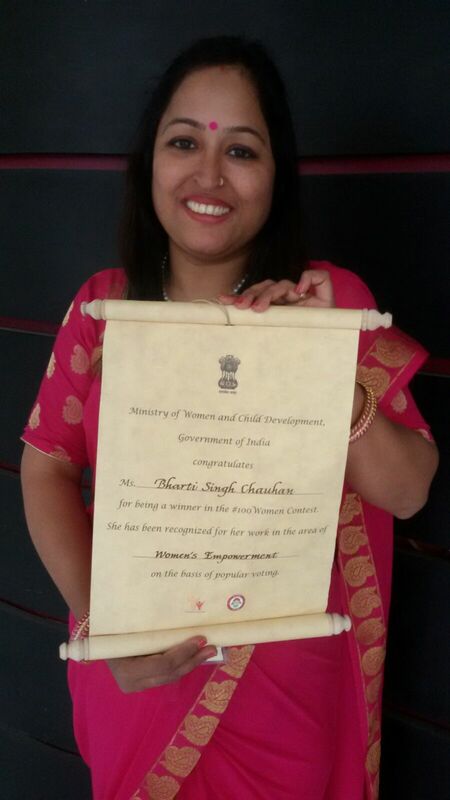 Maenka Gandhi for my contribution towards society under the category of Women’s Empowerment. I was also recognized by the Ministry of Women and Child Welfare Department and the Government of India in association with Facebook as one of the 100 Women Achievers of India, under the category of Women’s Empowerment. I am now the State Chairperson of the Women’s Economic Forum All Ladies League (Rajasthan). I am also working on the “Spotless Dame - Celebrate the Red Droplets Initiative.” It started when I took a stand to talk about the taboo around menstruation. We started group conversations and built understanding around the need for women in the 21st Century for their healthcare. We not only started awareness drives, but also helped by giving them a yearly supply of pads to the girls, in order to build a sustainable model. Another campaign we work on is called Respect S.H.E. (Solicitude for Her Esteem), which focuses on encouraging men and boys to provide the needed support to the women in their lives so they can rise to their potential. Men and boys are sensitized towards the need of a woman and how it can uplift the society altogether. The campaign gained international attention and several organizations added to it by participating. My main aim is to make Rajasthan a safer state. And, I believe it can only happen when women are educated and empowered, plus the men, too, understand the importance of supporting the women of their life. This is why I also run campaigns for men, especially, young boys!